The board currently comprises ten directors from a range of professional backgrounds complementary to the objective of restoring the DC-2. UMCT Board, May 2018, (Back, L > R) Tony Brandt, Meg Harmer, June Shanahan (Treasurer), Michael Thomas. (Front, L > R) Nicole Thomas, Pieter Mol (Chair), Ivo Mol (Secretary). Absent - Allan Harrison, John Stutchbery, Jenny Tanner. Nicole Fransen, Pieter Mol and Ivo Mol, were committed supporters of retaining and restoring the Uiver DC-2 in Albury. When council announced their decision to dispose of the Uiver DC-2 through an Expression of Interest (EOI) process, the three joined forces and submitted an EOI under the informal banner of the Uiver Memorial Museum Group (UMMG). They had a vision to build a hanger, relocate the aircraft, and restore the plane to museum standard for static display. In March 2013, UMMG was selected as the winning tender by council, and the dream to restore this Albury icon to its former glory began. Under the terms of the UMMG proposal, a not-for-profit organisation (UMCT) was formed, with a Board of Governance of individuals representing various sectors of the community affiliated with, or supporting, the Uiver Project. 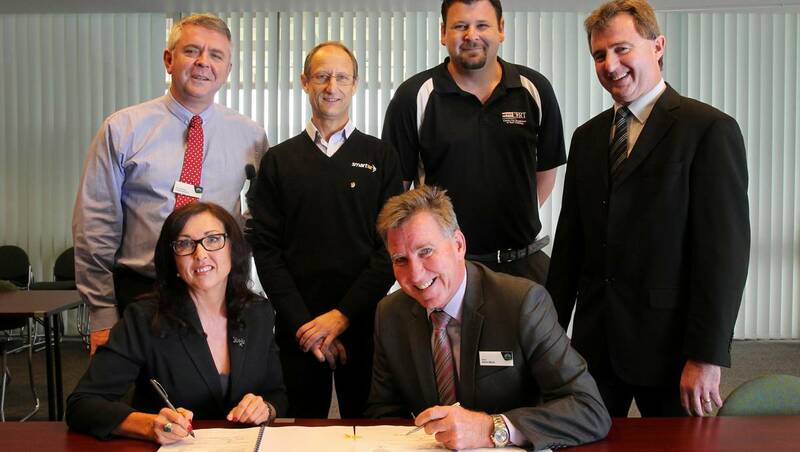 AlburyCity Mayor, Kevin Mack, formally signed over ownership of the DC-2 to UMCT in October 2014, prior to a the weekend of celebrations for the 80th anniversary of the Uiver rescue. (Back, L > R) Frank Zaknich, Ivo Mol, Deputy Mayor Ross Jackson, and Brad Ferris. (Front, L > R) Nicole Fransen, and Albury Mayor Kevin Mack.